Home Articles Supplements What is Emoxypine and how it can benefit you? What is Emoxypine and how it can benefit you? Emoxypine is an antioxidant that is similar in chemical structure to Pyridoxine (Vitamin B6). Its mechanism of action involves its ability to function as an antioxidant and its membrane protective effects. Users of this supplement can expect to experience anti-stress, neuroprotective effects, anti-inflammation and nootropic properties when using this ingredient. This is due to its ability to inhibit free radical oxidation, increase the activity of antioxidant enzymes, play a key role in the modulation of the receptor complexes of the brain membranes and the activity of membrane-bound enzymes, stabilise bio-membranes and increase the dopamine content in the brain. The primary benefit of taking emoxypine is its nootropic effects. It acts as a psychological aid, helping to promote greater levels of concentration and cognition. It works differently to other nootropics as it works by protecting neurons and increasing blood flow to the brain, whereas other nootropics exert their influence or alter the behaviour of neurotransmitters in the brain such as serotonin. The increase of dopamine levels in the brain by taking emoxypine also help to improve cognitive ability. 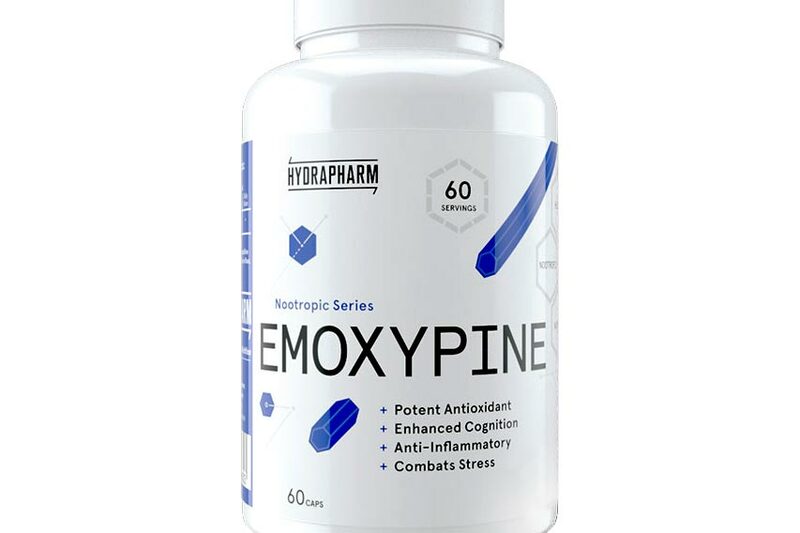 Emoxpine provides a protective effect for the brains neurons from free radicals. Free radicals can have a harmful effect on the brains neurons and emoxypine diminishes this as it can inhibit free radical oxidation. This also plays a role in its ability to increase focus and enhance learning and memory. Studies have shown emoxypine to shield against stress and anxiety. It was demonstrated that empoxypine helped to reduce the feelings of anxiety and assist participants to normalise and improve their behaviour following stressful events. Additionally, there were also no side effects reported from taking emoxypine- something that has become a norm when taking conventional drugs to improve psychological conditions. Emoxypine’s antioxidant properties allow it to provide further support and protective capabilities for membranes. It enhances the activity of various antioxidant enzymes, such as superoxide dismutase, while simultaneously inhibiting free radical activity. The use of emoxypine for its anti-inflammatory properties provides a reduction of pain and promotes rapid recovery of the peripheral nerves. One study, researching its anti-inflammatory potential, found it to decrease back pain in lumbosacral radiculopathy. Taking emoxypine allows you to improve your psychological health without any side effects. It has antioxidant functions, inhibits free radicals, provides neuroprotective effects, anti-stress and anti-anxiety properties, anti- inflammatory effects and increases dopamine levels natural in the brain. These effects culminate in greater cognition and improved mood – resulting in a surge in focus, attention and concentration. It works differently to other nootropics due to focusing on providing protective effects, rather than influencing or altering neurotransmitters.